It might be the fact that I've been listening to the soundtrack of Shawshank Redemption on repeat, or that another month of school is slowly ticking it's life away, but lately I have been having a hard time finding the purpose behind making work. Countless hours spent in the studio till odd hours in the morning must produce some sort of reasoning right? When does this moment of "ah ha" happen, because I am not finding it. (I assume this is a normal conclusion for someone in my predicament, but it is never the less frustrating.) All I am getting is more and more questions. Questions like what happens when I wrap and tie my ceramics up to the point they look constrained and bound to no end? What does it mean to want to contain this space within, to restrain it from escaping with strings, twine and bindings? What does color do to the pieces, does it make them less chaotic or more so? Never ending questions that I still can't even begin to answer. But enough of the whaoo is me, I can't figure out the meaning of life bull crap! I have made some big leaps since last week. First off, I am going to my second conference of my grad school career in Savannah this upcoming weekend and will actually be Chairing my very own panel session. This is a big deal people! Its through the British Commonwealth and Postcolonial Studies International Conference and I am one of four conference liaisons that will help host, direct, and chair the conference as a whole. I am extremely excited about this since it's a major opportunity to learn the insider scoop on how conferences work and how to properly chair panel sessions. I will be watching a number of sessions on Friday at the Conference, and then actually running a panel by myself Saturday, called Gender Equality in a Postcolonial Context with three foreign presenters discussing their papers. This week also brought about my first exhibition of the semester, in Gallery 303 at Georgia Southern called Inspired. It's a mixture of student work, both graduate and undergraduate level and will be on display for just over a months time. I also applied to the Vermont Studio Centers residency program in hopes to land a residency over any of the school holidays later this year. We'll see what happens I suppose. There's also one other major event that happened but it's still under the radar so I won't be able to disclose it this week but maybe next week I can spill the beans on another great opportunity I received. Until then I'm keeping my fingers crossed for the best! I found a number of different artists to highlight in this weeks blog, and narrowing them down to one I really wanted to discuss was tricky. Right now in my studio I am dealing with figuring out the right size my pieces should be, their color, and their texture. The artist I found that helped me most answer these questions is Canadian sculptor Susan Collett. 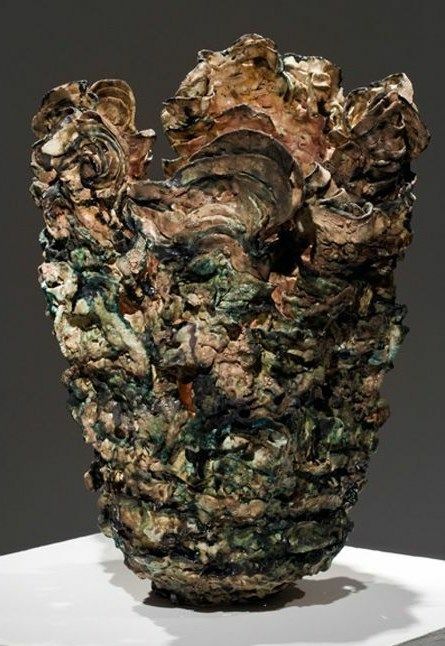 She creates large scale ceramic works that she pushes towards the edge of collapsing by stacking hand built clay slabs one on top of the next. He pieces are extremely sculptural which is something that I like because my works also have no functional purpose. This May, her and two other ceramic artists are exhibiting in Montreal at the Galerie Elena Lee in a show called Master Ceramicists. She's had her ceramics displayed all over the world, in places like Dublin, Taiwan, and New York to name a few. Two of her body of works from 2015, called Aggregate and Maelstrom are probably the most influential to me at this time simply because of their visual qualities. Maelstrom is mostly black and white while Aggregate is full of color. The contrast in surfaces in the two groups has shown me that one artist can swing both ways and doesn't have to commit to one style. The works are very much alike structurally, but their glaze coloring groups them into different collections-something that I want to try in my future pieces. I miss working with bright obnoxious colors, but making that happen in ceramics and it not look muddy or like a big accident is a logistical nightmare. I completed four new pieces this week and tried color out for the first time in them. I am still not sure if I like the results yet or not. I am working with stains that do not run or flux much, but that leaves them almost with a milky surface texture. I only glazed the string and twine a color, leaving the body of the piece a soft white. So now I am left with collapsed and slumping forms wrapped and tied down with bright yellow, orange, green, and black "string" which isn't actually string at all because it's all just ceramics. One piece in particular which I have named Box is encased in black thread, even across its gaping opening. But one yellow piece of string works its way throughout the encroaching blackness on the white body. It's a pretty powerful looking piece in my eyes, but I think only because I know how much went into making it work. I'll have to see what the audience thinks about it, and it's fellow colorful companions next critique. The newer pieces I am working on have scaled up in size, as well as techniques. I've changed clay formulas, adding more alumina hydrate to stiffen the mix, and sprayed white engobe on the forms to give them a whiter base once bisque. This should increase their opaqueness once glazed and the underlaying clay body will not be as visible. I will also be making a porcelain body clay this week to try out, because the type of clay a person uses is just as important as what the final piece looks like. Not saying that my clay body is bad, but to a ceramicists, a stoneware clay, and earthenware clay, and porcelain clay all come with different difficulties and qualities once fired. I'm going for a whitest of whites clay body, so porcelain is my next move. I may not know all the reasons yet as to why I am making the things I make, but I at least have a direction and that's all that matters at the moment.